Go to the Request Form to apply to adopt a kitten or cat. Bella Black Foot, my Siberian cat, was a really big cat. She weighed at least 20 pounds, but was never fat. She was really smart, and had a vocabulary to let you know how she felt about things, and liked to talk to me. She had a big purr, too. She liked purring in my lap when I read my book every night. In the mornings, she liked to play fetch with a wad of paper, like a dog. I taught her to do it by tying a string to a wad of paper and pulling it towards me after she got it in her mouth. She learned fast. **She was the kind of cat that needed toys, and it was easy to find the ones she liked best. Her fur was thick and got thicker in winter. We lived in different places over the years, and she always adapted well. When we lived in an area where it was safe for her to be outdoors,*** I made a cat door so she could climb the tree in the backyard, and come and go when she felt like it. The first day we went outside, I went around the edge of the yard with her and explained this was ours. So she 'knew' the boundaries of my property, you see, and would stay inside the boundaries. She would 'patrol' the boundary by walking along the top of the fence in the backyard when she went outside, then she'd go into the front yard... where there was no fence, and she'd walk around the edge of the yard, too... but never go outside the boundary. She did this on her own, and enjoyed 'patroling' her boundaries every day... inside and outside the house. She treated it like a job, rain or shine. We were outside together one day when a German Shepard that lived down the block started running towards us. I went to pick her up, but the dog got there first. She didn't run. Instead, she stood 'her' ground, completely confident, 'fluffed' and growled real loud... and the dog stopped in its tracks. Then she growled again, and chased the dog half way down the block. She turned around and strutted back home with her tail straight up and twitching at the tip. She was magnificent, and knew it. No dog ever bothered her again, and my cat never left the yard again. I've never known another cat like her. She was very territorial, and she knew what was hers, like a dog. She was smarter than most dogs, which is unusual. It's too bad she'd been neutered before I got her. Her traits would have been worth sharing. She loved people, and enjoyed being sociable with other people. But she loved me best, anyone could see that. She was a delightful companion, and she spoiled me with affection. I still miss her. I don't expect another cat will be like her. But I do like big, smart, friendly cats. 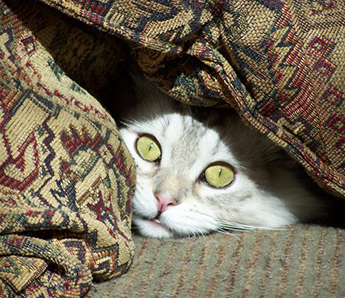 **Most Siberians fetch, we learn. ***I DO NOT RECOMMEND LETTING YOUR SIBERIAN CAT OUTSIDE WITHOUT A LEASH!!!!!! 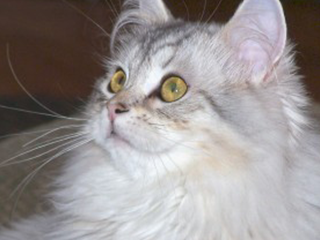 See our gallery of Siberian cats and kittens or read family testimonies. Watch how Siberian cats play fetch... better than any dog! We have imported most of our Siberians directly from Russia. 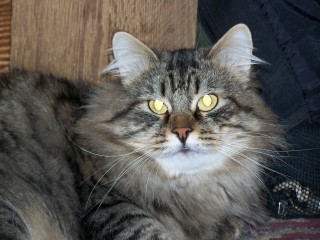 Our Siberians have screened for HCM by a Board Certified Veterinary Cardiologist. We carefully plan our litters to produce the sweetest, most beautiful, loving kittens. Our most important goal is to produce healthy kittens who will preserve the Siberian Breed Standard. Our purpose for showing is to keep to the highest standards. The other goal we consider as important is to produce the most hypo-allergenic kittens we can. Nothing is worse than for someone to love cats, but be unable to have one because either they or a member of their household has allergies. We get so much joy in helping to make people's dream come true to have a kitten without allergy issues. This form allows me to match potential families with available kittens and cats. It is securely sent directly to my email and is dated and timed. Additionally, there is a Sample of the Purchase Agreement available to read prior to purchase.